Information on pricing and availability for two enthusiast Ryzen Threadripper CPUs, as well as for two of the entry-level Ryzen 3 CPUs was presented in AMD's latest product update video, along with some Cinebench R15 benchmark results that depict the Threadripper models as clear winners against Intel's direct competitors. In their latest product update video published on Youtube, AMD unveiled information on the availability and pricing for two enthusiast Ryzen Threadripper CPUs, as well as for two of the entry-level Ryzen 3 CPUs (no pricing for these, though). 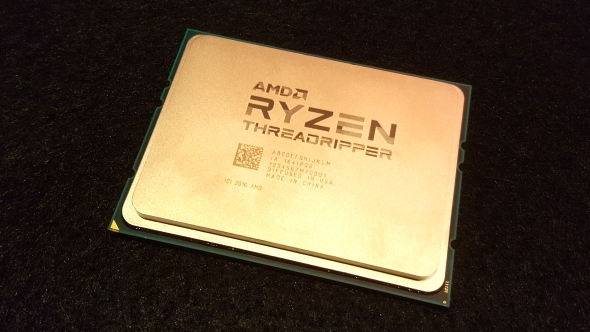 The video also presents a comparison between the Ryzen Threadripper 1920X CPU and Intel’s Core i9-7900X. AMD’s 12-core CPU beats Intel’s 10-core by a score of 2,400 to 2,100 in Cinebench R15. Worth noting here is the price of these two CPUs: AMD’s 1920X costs $799, while Intel’s i9-7900X costs $999. The direct competitor (price-wise) for Intel’s CPU would be AMD’s 1950X, which manages to score almost 50% higher in Cinebench R15, with its 3,000+ score. If we are to find a direct competitor (performance-wise) for AMD’s 1950X CPU, that would probably be Intel’s i9-7960X, but this one costs almost 60% more, currently selling for $1,699. These are not really conclusive tests, but still, the performance discrepancies are there.